Some custom skills require the ability to connect the identity of the user with a user in another system. This is referred to as account linking, since the goal is to create a link between the Alexa user and the user account in your system. Connect a skill to a service you run. Connect a skill to a third party service that supports OAuth 2.0. Do you really need account linking? Account linking is needed when the skill needs to connect with a system that requires authentication. If your skill just needs to keep track of a user to save attributes between sessions, you can use the userId provided in each request to identify the user. 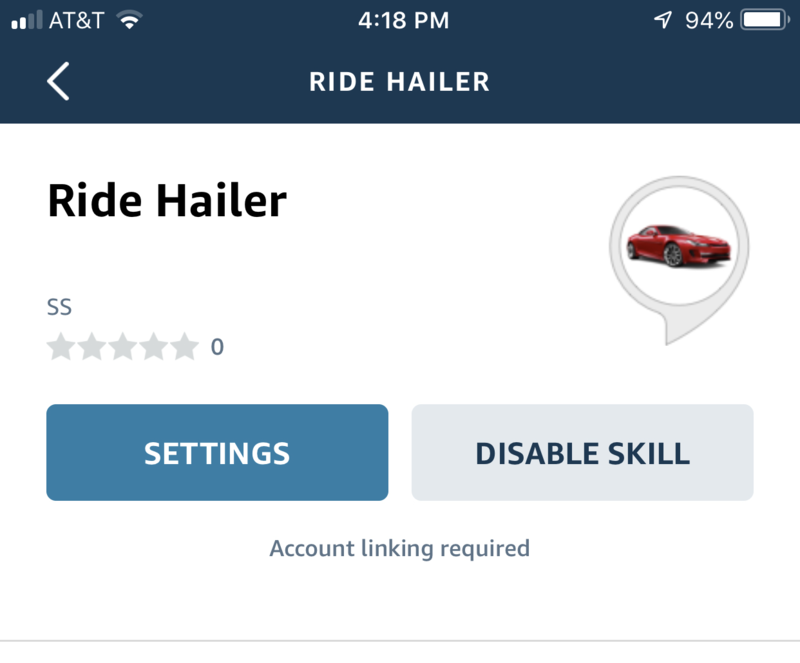 The userId for a given user is generated when the user enables your skill in the Alexa app. Every subsequent request from that user to your skill contains the same userId unless the user disables the skill. Persisting attributes between skill sessions is built in to the ASK SDKs for Node.js, Java, and Python. For details, see ASK SDK documentation about managing attributes. For a sample skill that illustrates persisting user attributes, see High Low Game. From a link account card in the Alexa app after making a request that requires authentication. This gives users flexibility – if the user skips the account linking step when enabling the skill, they can come back to it later, after making a request that requires the authentication. Your custom skill can also make account linking optional. For instance, you could provide basic functionality that does not require authentication, and then more advanced functionality that does require it. When you configure your skill in this way, the user does not see the account linking flow when they enable the skill. For more about this option, see Let Users Enable Your Skill without Account Linking. In both of these cases, you can determine whether the user has linked their account by the presence of the access token (accessToken) in the request to your skill. See Get the Access Token from the Request. Enabling a skill. Note that the skill card indicates that account linking is required. The skill detail card if the user did not successfully complete linking the accounts. 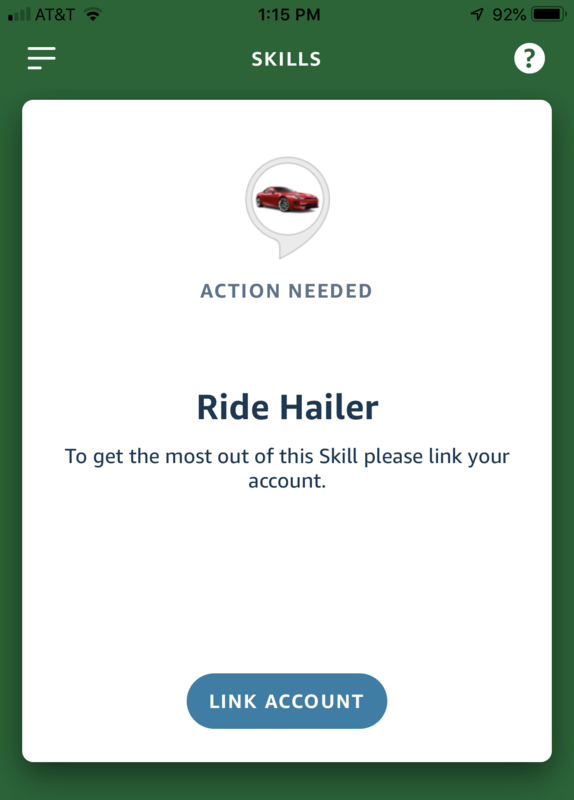 This flow is possible if the user skips the account linking process when they enable the skill or if they enable the skill by voice instead of with the Alexa app. Users can skip the account linking flow when enabling the skill if you select the option to let users enable it without account linking. After the user makes a request that requires authentication, your skill returns a link account card (LinkAccount) directing the user to connect their accounts. As noted previously, you can determine that the user's account is not linked by checking for the presence of the access token (accessToken) in the request to your skill. See Get the Access Token from the Request. A link account card in the Alexa app. Once the user starts the process, the app displays a login page for the other service. The user provides their credentials in the login page and authenticates with the service. The user is redirected back to a "success" page within the Alexa app and the skill is ready to use. If the account linking was successful, Alexa now stores an access token (provided by the other system) that identifies the user in the other system. This token is now included in all requests to the skill, so the skill can access the user's information in the other system when needed. 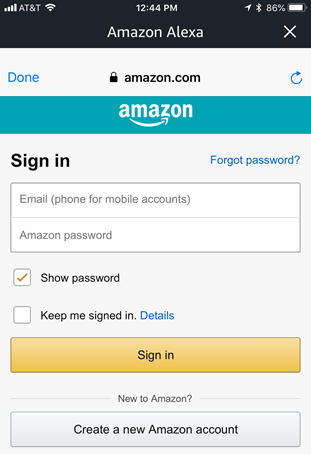 In this example, this skill uses Login with Amazon, so the user sees an Amazon login page within the Alexa app. Users can invoke the skill and make requests normally. If the user's account has been successfully linked, the requests include the access token. The skill uses the token to access information in the other system. Car Fu: Ordering a ride using your Car Fu account. You wanted to go to your default work location, right? Speech text that briefly explains the benefits of linking accounts. 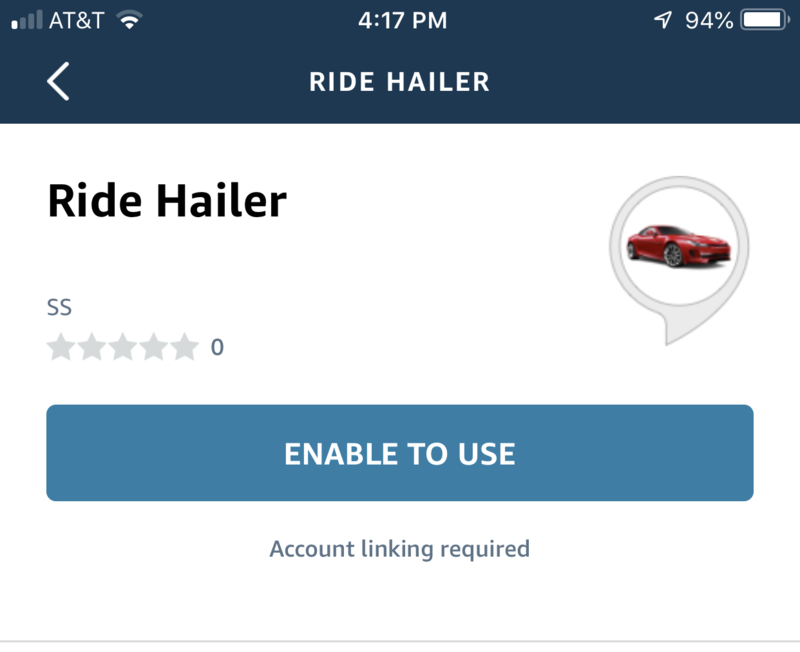 A link account card that the user can use to link their account in the Alexa app. User: Alexa, ask Car Fu what services are available in Dallas. This sends the CarFuAvailabilityByCity intent. This intent gets public data from the Car Fu service and does not need to access the user's Car Fu account. Therefore, the skill does not check for the presence of the access token, but just delivers the response. If the user disables the skill in the Alexa app, the Alexa service deletes the access token associated with that user and skill. This removes the link between the user's Alexa account and their account in your service. 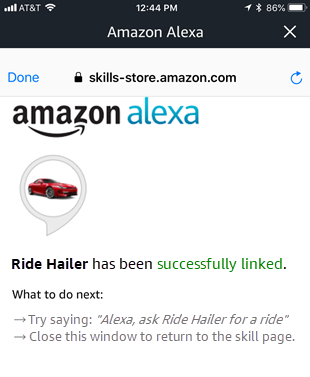 If the user later re-enables the skill, they will need to initiate the account linking process again to create a new link between their Alexa account and their account with your service. The primary difference between these two types is in how the access token is obtained from the authorization server. In implicit grant, the authentication server returns the access token after the user logs in during the account linking process. In authorization code grant, the authentication server returns an authorization code after the user logs in during the account linking process. Alexa then uses this code to request an access token / refresh token pair from the authorization server. Alexa can then use the refresh token to request a new access token / refresh token pair after the old token expires. While implicit grant is sometimes easier to implement, authorization code grant is the more secure, robust solution and it should be used if possible. Implicit grant can be an option if your authorization server does not support authorization code grant. Note that if you use implicit grant, and the token ever expires, the user must re-link their accounts in the Alexa App, which can cause a poor user experience. Note: Skills that use other models, such as smart home or video, are required to use authorization code grant for account linking. Decide whether to use implicit grant or authorization code grant as your grant type. Add account linking logic to the service for your skill. Your skill code needs to check for the access token on incoming requests and take appropriate actions.